In my spring semester of my freshman year, I began my UX Design Experience Studio class at Purdue. In this class of 30 students, we were put into groups of five and were given a UX project by an industry sponsor. My team consisted of myself, Jason (team lead), Morgan, Jessi, and Stephanie. Digital Dackel is a health tech startup focused on improving the lives of dementia patients through wearable technology. The product allows caretakers of dementia patients to locate their loved ones, and be alerted if their loved one has wandered off. My team's task was to design a mobile application that the caretaker would use to ensure the safety of their loved one. Our team began our project by conducting secondary research on dementia to better understand our users. Dementia is “A chronic or persistent disorder of the mental processes caused by brain disease or injury and marked by memory disorders, personality changes, and impaired reasoning” (“Alzheimer’s and Dementia”, 2017). Dementia is not a specific disease, it is an overall term that describes a wide range of symptoms including memory loss, ability to pay attention or focus, difficulty with communication and language, impaired reasoning and judgement, and loss of visual perception. The most common type of dementia is Alzheimer’s disease. Sixty percent of people dementia will wander. If the patient is not found within 24 hours, up to half the people with dementia will suffer serious injury or death. Wandering can occur with a dementia patient in any stage. Our secondary research told us that 48% of caregivers are 18-49 years old, and that 35% of caregivers are 65 and older (caregiver.org). Following Alan Cooper’s principles of User Interface Design in About Face, we focused on the age group of 65 and older since they have the most specific needs. According to Cooper, if we satisfy their needs, we can satisfy the needs of all of our users. Avoid using text sizes smaller than 16px, and we should allow users to adjust text sizes themselves to account for their needs. Pay attention to contrast ratio with text, and avoid blue for important interface elements. Make sure that buttons on touch interfaces are at least 9.6 millimeters diagonally. We should not make assumptions about prior knowledge for this age group. Also, we should test all parts of our design for usability, even parts that we did not create ourselves. Design a product that helps people focus on one task at a time. Accordingly, we should avoid dividing users’ attention between multiple tasks or parts of the screen. We conducted casual semi-structured interviews with 10 individuals from a selection of our age range. These interviews were conducted in a few different ways including over the phone, through video conferencing tools, and face to face. We had the opportunity to talk with mostly informal caregivers in the 18-49 age group, which our secondary research showed to compose approximately half of all informal caregivers. Slide through this slideshow to look at our personas which were based on our interview results and secondary research. We started our design phase with brainstorming with wireframes. We took inspiration from our competative analysis, our sponsor’s mockups, and experimented with new UI elements based on our interviews and secondary research. We split the functionality of the application into a few different subsections in order to allow different members of the group to research and test their initial concepts with others. This allowed us to get a few steps of iteration before moving into a paper prototype. It also proved to be quite efficient. Once each team member had their wireframes finished, we came together as a group and talked about our wireframes. We went through each component of the app and discussed each of them to create lo-fi mockups that we could test. We created our mockups with our primary persona in mind: Laura Davis. In her situation, she is looking for her wife, Frankie Davis, after she wandered off. This carousel features our initial paper-prototypes. Next, we began our testing at a nearby nursing home, The Springs at Lafayette. Guerilla/Cafe Usability testing is a common UX tool, usually employed when projects have tight deadlines and need valuable feedback with a limited amount of user testers available. It’s a quick and impromptu method with users in a cafe-type environment. It can be used to test high and low fidelity prototypes, and it takes a relatively short time. You can view our usability testing protocol here. Users were confused with the "Start" button. In testing, multiple users didn’t understand what they were "starting", which meant we had a language error. Buttons needed to be bigger due to common challenges with dexterity for seniors. Some were confused with our use of a persona name. The phone icon here was incorrectly assumed to be part of the map. Using the input we got from our usability testing, we made final changes to our mockup. In May 2017, Jason (our team lead) pitched our project at the Purdue Polytechnic Innovation Summit (Read about it here). Winning this summit was incredibly rewarding. I learned so much about how to work effectively in a design team, and I became a better designer thanks to Jason's incredible leadership. 1. Designers must "fall in love with the problem, not the solution". Sometimes, us designers get so caught up in deadlines that we quickly try to brainstorm solutions without fully understanding the problem first. Instead, we just take the time to empathize with our user so that we can design for them effectively. 2. Usability testing is incredibly eye-opening. 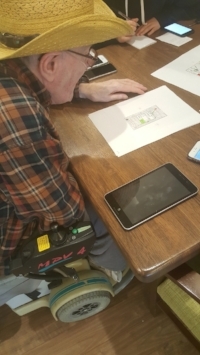 When we conducted usability tests at the Springs at Lafayette with users 65 and older, I'll never forget how appreciative people were that we were building such a useful app. 3. Great leaders don't just dictate, they lead by example. Instead of telling our team, "do this" or "do that", Jason showed us how to become great designers by vocalizing and demonstrating his design process. Seeing how Jason approached problems gave me insight into how I can improve my own design process.